Lock in a great price for Cotommatae Hydra 1810 - rated 9.6 by recent guests. Great breakfast/buffet. Warm welcome. Very nice and cosy deco. Perfect bed! I loved staying at a property that was a restored house. Every room is different and it feels like you are at home. 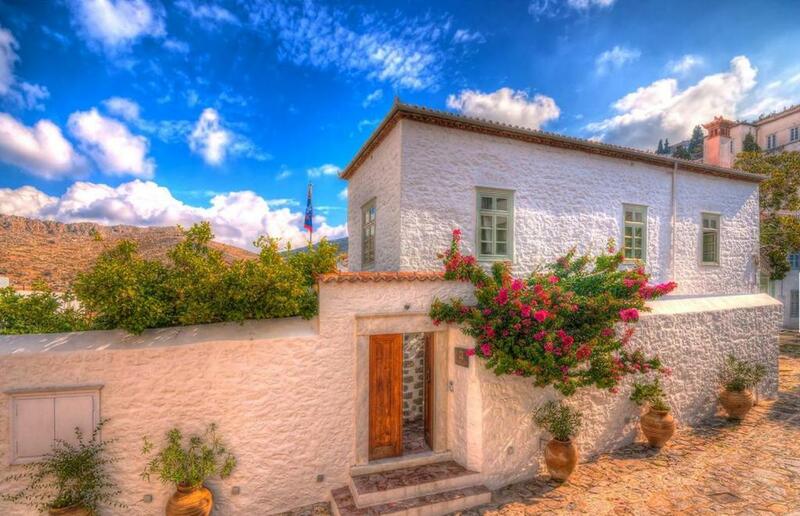 This is the property you dream about when you travel to the Greek islands. Just feeling at home, during our second visit there. The breakfast is exceptional, and the staff very friendly and relaxed. The property was exceptional. Everything was of high quality we’ll finished and comfortable. Could not have asked for more. This is one of those places you have to recommend to your friends. Exceptional hotel with easy and fast access from the port. Friendly and helpful staff. Crystal clean everywhere and the rooms well maintained. The home made feel of the breakfast on the rooftop terrace was also a definite bonus. My room had an "old world" feel to it. The bed had posts and mosquito nets. Staff were very helpful and friendly. This hotel is fantastic. So beautiful and well kept. I traveled alone and was given great recommendations as soon as I arrived for beaches, restaurants and ways to spend time. I was there for two days and it meant I enjoyed every minute of my trip. The two guys who run it are friendly and hospitable but really laid back. They leave you to it when you want but are there if you need them. The atmosphere in the hotel is lovely and the facilities and rooms couldn’t be better. Also the breakfast is amazing! Extremely helpful team. More than a room. Was like a little house. 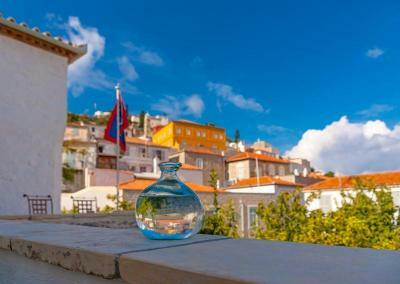 One of our top picks in Hydra – and a guest favourite. 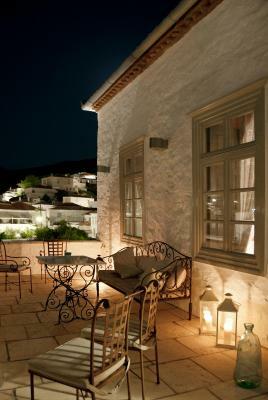 Cotommatae Hydra 1810 is housed in a 19th century mansion, only 200 yards from Hydra Port and the seafront with several restaurants and bars. 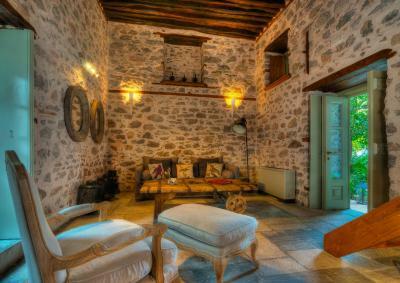 Surrounded by a garden with a stone-paved courtyard, it offers traditional accommodation with free Wi-Fi. 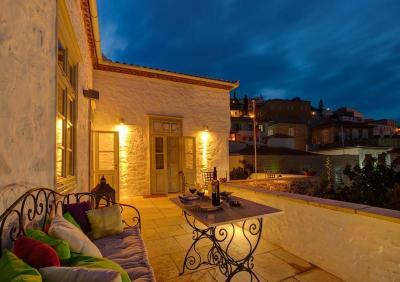 All air-conditioned units at Cotommatae 1810 open to a communal terrace with view to the scenic Hydra Town or have straight access to the garden. Fitted with beamed ceilings, each offers a flat-screen TV with DVD player and minibar. Featuring wooden floor, the marble bathroom includes a crystal cabin shower, Korres toiletries and Guy Laroche towels. Some accommodation types are split-level with stone walls. The breakfast, enriched with handmade pies, fresh juices and local sweets, is served at the lounge area with the fireplace or in the privacy of the rooms, on request. Guests can also choose among a variety of wines. Cotommatae 1810 offers easy access without stairs. Water taxis in order to visit nearby beaches can be found at 200 yards from the property. Hydra is only 1.5 hours from Piraeus by hydrofoil. This is our guests' favourite part of Hydra, according to independent reviews. Cotommatae Hydra 1810 has been welcoming Booking.com guests since 13 Jul 2012. 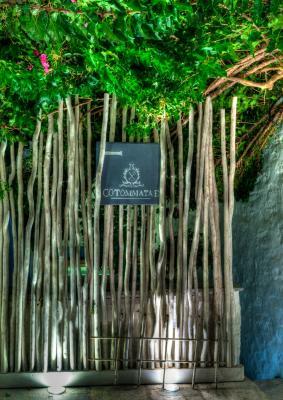 When would you like to stay at Cotommatae Hydra 1810? 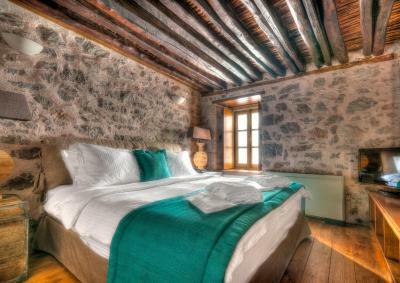 Located on the 1st floor, this suite offers wooden floors, light blue walls and romantic decoration details. Offering a private yard, this room spreads on the ground floor and the mezzanine. 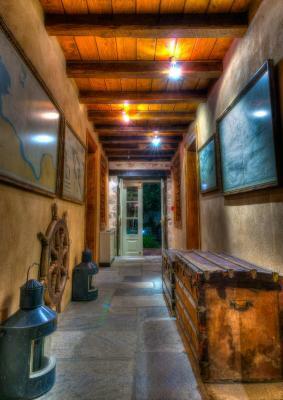 Features stone walls and traditional decor details. Featuring a private, outdoor hot tub and private wood deck terrace, this spacious and elegantly decorated suite is fitted with stone walls and a wood beam ceiling. 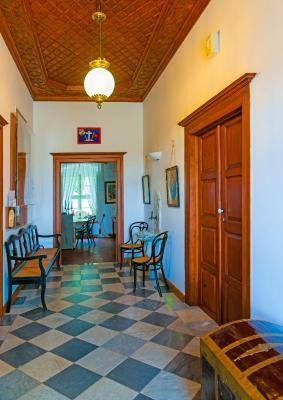 Fitted with antique items, this air-conditioned room opens to a shared terrace and offers a window. It has a minibar and a flat-screen TV. Its private bathroom features a carved washbasin and marble facilities. Free WiFi is provided. House rules Cotommatae Hydra 1810 takes special requests - add in the next step! Cotommatae Hydra 1810 accepts these cards and reserves the right to temporarily hold an amount prior to arrival. Please note that the property pre-authorizes the provided credit card 14 days before the arrival date of the guest. Espresso machine out of order and in the 2 levels bedroom, there was one window at the top, almost impossible to access so I couldn't close the shutters to have a complete dark bedroom at night. It’s a shame but our room had a mezzanine where the bed was. It was accessed by a staircase which quite frankly was dangerous and made us feel quite insecure. The steps are a bit narrower than normal but most significantly there was no balustrade which was very awkward in the night as the bathroom was downstairs. It’s hard to appreciate why the balustrade is not there as it would be an easy retro fit and affect the aesthetics. But it would make it much more secure. I hope they do this soon. No complaints. You do have to throw a switch to get the water to heat but it heats quickly. The rooms are in a very charming house. The room was ready when we arrived and it was early in the day. We loved the room. The bed, linens and towels were all high quality. The view is wonderful. The host was very welcoming and gave us a good overview of the island. I wanted to swim and suggested several places to swim and lent me a beach towel. The breakfast was absolutely spectacular. Great coffee, eggs with fresh tomatoes, fresh squeezed orange juice, yogurt, fresh fruit, three kinds of wonderful pastries including croissant, chocolate croissant and maybe a carrot cake, wasn't sure but it was delicious. Staff could have been more helful - breakfast was not good value - bread was not fresh - eggs were left on over heat too long, our suite was not private the cats were drinking from the jaquzzi - cat poo on the deck - staff were indifferent - end of season tired it seemed but still charging Full price! It was our 30th Wedding Anniversary we didnt want anything Complimentery however it would have been nice to have been wished a Nice Day - we had notified at time of booking. I mentioned it on leaving however distinterested staff again. Lovely relaxing hotel that provides great place to relax. Excellent breakfast too! The cooked breakfast was always cold despite arriving on time. The room was too dark. I think the value for money was not there for such a room. Everything about this little jewel is wonderful! The staff weny above and beyond our expectations!